NTP-IP Innovations is a Legal Services consultancy for Intellectual Property. Our working concept sets us apart from many IP services because our priority is to join with your product developers to maximize their project time and minimize disruptions. In effect, our “IP-Focus” process works in parallel with your project plans to take care of the often tedious, complicated documentation and specification refinements required to convert an idea into a patent disclosure or other IP submittal. However, we realize it is also essential that a non-disruptive disclosure process is established before IP filings can begin in earnest. In effect, we will show you how to efficiently put the appropriate IP implementation processes into place well before your product is released. 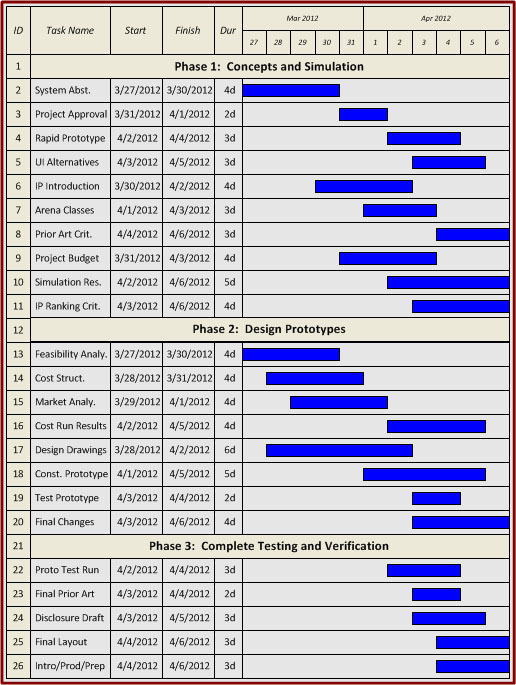 We all know that every project plan has a critical path. Our goal is show you strategies that keep the patent filing process OFF the critical path. We use a variety of techniques to accomplish this, with the primary approach being to move patent activities earlier in the project. When this is not possible, we often employ techniques to offload, and strategically integrate, IP-related detail work into the overall effort. The adoption of project-integrated IP has the effect of minimizing additions to critical tasks and adding "off-staff" parallel activities to your project network at substantial savings to you. Another technique is to formulate an [active plan] to work the patent process into each project template so that IP tasks become integrated into the overall product development spectrum. Then, as the projects are prioritized, the most important projects automatically get the appropriate IP attention. For more information on how to dovetail IP tasks into your company's project work breakdown structure, give us a call and we'll work out a plan to effectively satisfy your IP-related goals and objectives.